St. Luke's Hospital on the Plaza in Kansas City, Missouri is one of a few places in the nation testing a new weight loss pill that patients can ingest during their lunch hour. So far the rates of success have ballooned — literally. The inflatable pill, called Obalon, could be just months from hitting the market. Heather Couch has swallowed the pill twice and will once more in a few weeks. She's hoping to overcome something else that's also hard for her to swallow: unwanted weight that's been difficult for her to lose for years. "They literally walk into the room and swallow this capsule," said Dr. St. Luke's Hospital gastroenterologist Sreeni S. Jonnalagadda, MD. Jonnalagadda is conducting the clinical trials at St. Luke's Hospital for the next few months. The Obalon pill contains a little balloon inside. A long string is attached, and once it's in the stomach, Jonnalagadda blows it up with a canister of nitrogen. The makers say the inflated balloon takes up enough space that it's supposed to make people like Couch feel fuller faster. "A lot of times I'll just feel thirsty, not hungry," Couch said. Couch and others in the trial will eventually swallow a total of three balloons for six months. "There's no cutting, no surgery and you swallow the pill and you go home!" Couch said. 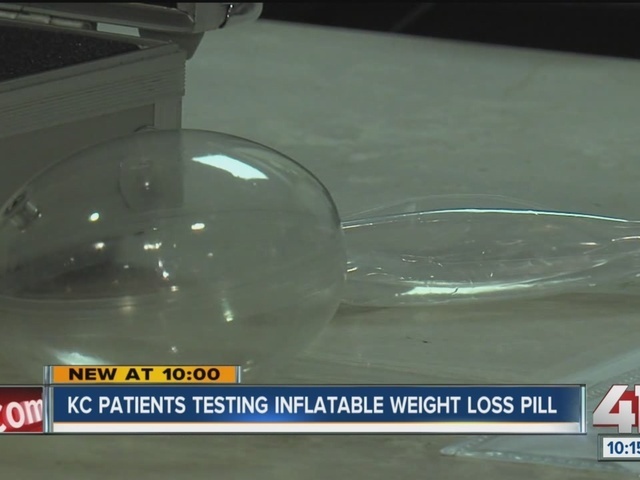 The balloon is supposed to help her and others in the trial lose more than 20 to 40 pounds in six months. Couch lost only four pounds in 6 months on a placebo, or sugar pill, earlier in the year, so she hopes the Obalon pill will help. There's one catch — patients still have to choose carrots over the carrot cake. "You really have to watch what you eat and you have to exercise," Jonnalagadda said. Couch's dietician says we have a sitting problem. "Sitting is compared to the new smoking. We've got to get up and move," said registered dietician Thelma Blew. The federal government considers 70 percent of Americans overweight. The pill is designed for those with a 30 to 40 BMI - the measurement of fat on our bodies. Most of us have a 26 BMI. "So there are more people who are going to be candidates for these therapies," said Jonnalagadda. Doctors are trying assess the unknown risks of the costly pill that costs thousands of dollars to take. If all goes well, Couch's doctor will eventually pop the balloons and pull them out of her mouth. By then, the hope is patients will have lost weight and mastered the prescription for the perfect pill: "Diet and exercise," Jonnalagadda said. Obalon's gastric pill is already available in England and in Mexico. The FDA could approve sales in the U.S. by the end of 2016. Can this balloon help you lose weight?